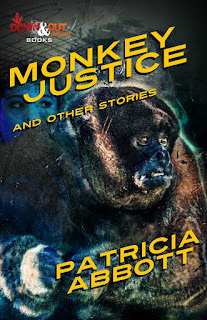 This week marks the welcome return of Monkey Justice and Other Stories, a collection of short fiction by Michigan author Patricia Abbott. Originally released in 2011 by Snubnose Press, an e-book imprint launched by the now late, lamented Spinetingler Magazine, Monkey Justice has been reissued in both paperback and Kindle formats by Down & Out Books, with a new cover design by J.T. Lindroos. I’m a big fan of Patti Abbott, who has contributed a couple of essays to The Rap Sheet over time (see here and here), and who I interviewed when her first novel, Concrete Angel, saw printed back in 2015. I also coordinated with her for many years on the Friday “forgotten books” series. Yet for some reason, I never read Monkey Justice when it first appeared, so it’s nice to have a second chance at poring over the contents. Its genesis is easy to remember. I overheard the entire story on a bus ride into work [in Detroit]. No kidding. Well, not the part about the protagonist working with monkeys, but the rest of it. Who could resist using a story about a man's wife and mistress giving birth to his daughters on the same day? The guy on the bus becomes Gene, the beta male, in my story. I even watched him de-bus at the [Michigan] Science Center. It was almost too easy to write it until I thought to insert the part about monkey behavior. ... Spending a week or two looking over recent capuchin monkey experiments was a treat. And those four anthropology courses finally paid off. Abbott (the mother of fellow writer Megan Abbott) has penned more than 125 short stories, and in 2008 won the Derringer Award for one of them, “My Hero,” which features in Monkey Justice. Concrete Angel was nominated for an Anthony and Macavity award, and her subsequent novel, Shot in Detroit (2016), was in the running for both an Edgar Award and an Anthony Award. All of this should make clear that Abbott has had the opportunity to polish her storytelling style. The stories here aren’t always easily classified as crime fiction, and some of the choices their players make in pursuit of justice may cause you to shake your head with undue force. But they’re just as likely to launch you on the hunt for more of this author’s work. Thanks, Jeff. So kind to highlight MJ.